Sheetal... A big HUG to you for commenting ..when I didnt get any comments after posting I thought my post was an utter disaster!! You have made me feel so much better!! Such a relief Shilpa..I am suspecting I put everyone to sleep with all the boring technical mumbo jumbo!! Thank you so much for boosting my morale!! Thank you so much Lisa ...oh Yes I actually spent 3 weeks obsessing and reading up about stamping basics.And I am going to keep repeating to myself that you said my stamping on this project is perfect!! A girl needs a big pat from time to time especially when trying out new things!! And I can always count on dear friends like you to give me a boost!! This is gorgeous and the receiver will be extremely thrilled to receive this gift, Sonia! thank you for sharing the tutorial with us! Thank you so much for dropping in..ha ha the receiver will be my hubby only!! Karon so happy you dropped in...I loved your blog and Thank you for helping me feel good with such a sweet comment! Wow what a good read it was! And amazing Amazing creation. I think your stamping and inking was perfect. Looking forward to more such informative posts from you. Jasleen you are a pro at stamping...I always drool over your projects!! lol...Thanks for such a sweet compliment doc, but I've just begun to explore the possibilities with inks and stamps and have a long way to go. Well, I agree with you that distress inks are not good for crisp images and are meant for shading. Although ideally this is the case, I think there are some instances where you want the image to be a little fuzzier so that it blends well with the shading or general theme of the creation. (for eg.tone-on-tone distress ink stamping where the fuzziness in the image looks beautiful, alteast to me :P) And also memento are best suited for stamping but I have used them for shading the edges and I'm happy with the end result. So i beleive we can try and experiment a lot with these inks as long as we like the results. Thanks again for such a useful info on pigment inks. I didn't know that itsy bitsy has their own inks too!! You are so right about the inks Jasleen..we need not let anything stop experiments!! 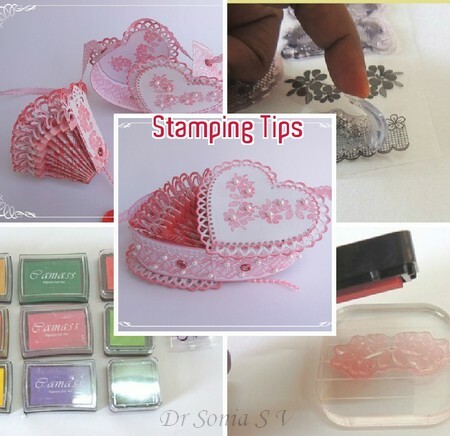 A wonderful tips on stamping post. I have been stamping for a couple of years and find that I still am learning about stamping. I also find that a stamp has to be seasoned sometimes before getting a stamp image you like so I practice with the stamp first. I have tried stamping on fabric, ribbon & other such materials. I use my heat tool when stamping on vellum since the ink needs more dry time. I find I like heat embossed stamping most. Have fav inks. Use to be Memento Tuxedo Black but now my fav black is VersaFine Onyx Black. I also like Tim Holtz Distress Inks and have quite a collection of them. My fav TH Distress Ink is walnut stain. I have used StazOn on my stamps and not ruined any. I do find that the smaller a stamp is the harder it is for it to stick to the block sometimes. A trick I learned is to rub the block on your pants, rub the stamp on your pants and then it will stick to the block better. Wise to get a set of blocks which I have 2 sets of: Fiskars & Stampin' Up. I also use unmounted stamps which require adding foam adhesive to to be able to stamp with. Fav stamps of mine are: Hero Arts, K Andrew Designs, Paper Smooches, Tim Holtz & Whimsical Designs to name a few. For less expensive stamps I have a collection of craftsmart rubber wood mounted stamps that I buy at Michaels. My most difficult thing about stamping is storage. I was keeping some clear stamps on the plastic they come on in a plastic sleeve in a notebook and found that over time the black image on the outside of the plastic that has the design pictured had worn off onto the plastic sleeve as if affected by heat but they were in a room not exposed to heat. I store most of my stamps in plastic storage containers & photo boxes some arranged alphabetically and some arranged by category/theme. Thank you so much for sharing such wonderful tips Melissa..I got scared to use Staz on after reading so many warnings online and a new Sizzix stamp I bought even had a warning about it on the package !! What a lovely box with tags! love the soft pink hues! thank you so much for this post Doc..I keep on searching what inks to buy based on the purpose and here I have a table!! more often than not I ask the sellers to advice me..but thanks to you I have my own list now...:) Loved the mouse pad idea and infact just tried it as well and the result is awesome!!... Thank you so much for the shout out..:) I am humbled! I discovered the mouse pad info only recently and was thrilled at the difference it made to my stamping!! one more thing, the box is quite magical. beautifully! What a wonderfully interesting and informative post Sonia, thank you so much for spending what I am sure was much time in preparing it. If it's any consolation I too had great difficulties when I firs tried stamping, I tries several time and in the end threw all my stamps any inks into a bag and they lay in the back of a cupboards for a couple of years. Then one day a lovely lady who used to do craft demos on TV took me aside and after half an hour with her I was well away and the rest as they say is history. And that small bad of stamps and inks has over the years turned into a rather large cupboard and draws. Anyhow, on to your pretty box which is a sheer delight, it is so delicate and feminine and will make a wonderful gift. Thank you so much for sharing your beautiful work and joining in my blog celebrations. Oh I am so thrilled to get such a wonderful comment from you Brenda...you are like a stamping Goddess!!! It will be so inspiring for amateur stampers to read this comment of yours as its so encouraging to novice stampers !! Wow sonia . This is just for me!!! I am so scared of using colors n stamps just gathering courage to give this a try..
Lavina you just made my day!!! I felt I am no authority to write a post on basic stamping as there are so many awesome stampers out there but the info on basic stamping is actually so sparse and scattered I had to dig and dig and experiment and experiment to come up with this post!! Hridya all my stamps were so far being used by my daughter. Crafty Blogosphere is such a generous place that over the years I have been gifted quite a few stamps ...now gaining the courage to put them to use!! What a gorgeous heart box Sonia...wonderful stamping and very pretty details..fabulous informative post today..I have saved to my favourites so I can readf again and take some info in..
Sweets! Have to say I read your post in detail and finished with a sigh wishing that there had been a post like this when I started stamping. I too like you never appreciated the art the stamping - felt I was no good at it and would rather not do it in any of my projects but ever since ItsyBitsy's new acrylic stamps came out, I found myself rediscovering this art. All my ink pads that I purchased in a hurry a year and a half ago are now being re-used... Thanks for sharing your experience, It is a very helpful write up and your project is just fantastic.. couldn't figure out what was stamped actually - it all looked so perfect as if it were printed. Perhaps you should do a Part 2 focussing on stamps that can be coloured in... if it interests you. That's a whole different ball game. Sunehra I must thank Rashmi for goading me to use the stamps.!! I was such a coward!! I took days to say yes to her and a further 2 weeks to gather courage to try it!! I love the lace design stamp and the best thing is the Itsy Bitsy ink pads seem made just for them!! Ha Ha writing this post itself made me loose quite a bit of sleep...am not yet ready for Part 2!! Really interesting and very informative post....loved each and every word you have written. ..its just perfect and right information s which we have gathered over a period of time....it will be very usefull for thebeginners to get all informations from your one post...in a nutshell ....thanks for sharing. Daksha you are so good with inks...such words from you are so precious!! Oooh you are so kind Nancy!! Hi Sonia..I might be the one who benefited more from this post as I am the newborn that you mentioned on your blog..I recently started doing handmade cards and I tried stamping on them..I must admit that I am not so much confident about those and not very much pleased too.. I hope that I try stamping again using your tips..Thank you so much for this informative post..
Love your post- you made a gorgeous project with your stamping! You have covered one very important FYI- conditioning new stamps- it will make such a big difference. I made charts for my different inks on different papers and keep them and refer to them often. Fabulous write up! And your friend is so right- half of the things I learn about- eg new techniques- are made up by people just trying out their products and discover- by accident or on purpose- how inks/papers, etc interact! Thank you so much Shelly ...I love the way you stamp and emboss! Thank you Sathya...I have a lot of pigment inks since I do most of the shopping from Itsy Bitsy and not online!! Oh my doc...you are such a giver and a knowledge box, all bundled up! This is such a detailed post and covers so many aspects, thank you so much. Ha Ha first time I am being called a Knowledge Box!! Thank you Rupa!!! Firstly the box is so beautiful. Lovely pink colour and the idea of tags attached to it is just amazing. Secondly I think this is the best information we get when googled about stamping. Sonia your blog is like a google search engine.Kudos and thank you so much for sharing such a wonderful information. Pavani...what a huge compliment!!! Big HUG!! Hussena you dont need the info on stamping basics!! Am so happy you feel my stamping is beautiful !! I am delighted..you are always so supportive my dear friend!! such a detailed post!! thank you so much for sharing the tips... it is of great help for newbies like me..
Berina so kind of you ...and you are no newbie I love your work!! Beautiful heart shape box..hmm seems the Valentine bug has got you :D ! pretty colors and the lace stamping n die-cuts make it even more gorgeous ! I loved to read a detailed post on stamping basics. I have few clear stamps n memento inks and initially I got blurred stamped images ,after conditioning and trying on different papers its better but still not crisp.The table on inks comparison is very very helpful I was very confused as to which inks to buy ,this info is going to help me when I buy new inks.Recently watched this (http://www.youtube.com/watch?v=BTfajhSHw3o) video on inks ,will be helpful for Part 2 :D ! Thanks a lot for such a detailed description . Thank you Pooja. I am yet to invest in Memento though I have read so many good things about it. I have a pet peeve about You tube videos Pooja..dont have the patience for them but since you recommend I will surely go and watch and ha ha dont expect a Part 2 on coloring...from childhood I have hated coloring!! Very informative post Dr. Sonia! I am new at stamping and I have bought all my stamping gear from Itsy Bitsy too . Your detailed information will sure help me in stamping in a better way. Great post Sonia...It gives me some enthusiasm to try some stamping ..wish me luck... the box is so cute.. Absolutely stunning project..and really great informative post. I m still not good with stamping and always make mess with it. I felt as if I'm reading wiki of stamping techniques .Thanks for sharing and your kindness ! Archana so happy a seasoned crafter such as yourself find this post useful! Thank you Alison...I am off to visit your blog! Divya I recently picked up a plastic "Handmade with love" stamp and it is such a no fuss stamp and gives such beautiful crisp images...you wont believe where I got it from...a gift shop in Mantri Mall!! Sonia, I am exactly in the same situation as you! I never got the hang of stamping, even though, at some point, I was thinking to buy a few and use them to create backgrounds for my quilled paintings. Now that I got to read your very, VERY long and informative post, I realize that things are much more complicated that I thought and I will consider all my options before purchasing stamps and inks. Even if you say you are a beginner when it comes to stamping, I think your little heart-shaped box turned very beautiful! Again, thank you so taking the time to research and then share all the precious info! Am so thrilled you find it useful Manu..yes I think thats exactly why many crafters tend to stay away from stamping...it looks deceptively simple but one needs to be aware of a few tricks of the trade!! The instructions are detailed, as only you know. The selection is great and it's really hard to decide what to choose. Anyway, your heart box turned out beautiful and perfect to me! The motif on the lid, side lace, color - everything! Thank you so much ...you are always so kind and encouraging!! This box is stunning - ABSOLUTELY STUNNING, what a great work of art and all the information that you have taken the time to write, just wonderful. Thank you so much Suzie...I am your biggest fan!! Such a pretty heart box... awesome stamping and very nicely done. I also took many years, almost 13 to start liking stamping and even now take quite a while to decide to do stamping. Specially clear stamps take a lot out of me. Yet it is such fun if it turns out nice. Monica I didnt know you disliked stamping seeing your projects you are such a versatile card maker!! Bibiana...!! I am always so happy when you drop in!! Such a detailed post on stamping. Very useful and informative. Box looks very elegant. Pink color looks more beautiful with all those stamps. Love this fabulous box!!! And your stamping is fabulous!!! Thank you so much Vicki ...yeah sure I will drop by your blog.I am actually your old follower!! Wow!! This is AMAZING!!! What a gorgeous box!! Wow!! So much detail!!! Stunning.. absolutely stunning!! Thanks so much for playing along with us at Open-Minded Crafting Fun Challenges!!! Good Luck! I hope we see you again!! Fantastic information and so kind of you to share. Your projects are amazing. I can't believe after seeing this box that you weren't good at stamping...this is absolutely stunning! I think I am a very simple stamper - your tutorial is very useful ! Thank you so much Claire ...I had to practise real hard to improve my stamping!! Thank you so much Suman...ha ha I did work really hard to write this post!! That was quite an expressive and detailed tutorial. As is rightly said, a new crafter is born everyday. Thank you so much for sharing. It was great help. That heart box project was totally amazing. That was quite a detailed tutorial. Rightly said, a new crafter is born everyday and you never know how you might help them. Your tutorial was of great help. Thank you so much for sharing. Thank you so much Lekha your words help make all the hard work seem worthwhile!! WOW that heart box is amazing what a gift for anyone. I haven't seen anything like it before it really is beautiful. I am like you certainly NOT a stamper, but see the Stampin Up Demonstrators come up with beautiful projects I am tempted sometimes, then I get a stamp out of my stash and make a mess of it and put the stamps away again, sorry but digi for me everytime, HOWEVER after seeing what you have done, I may even bring a stamp out and try again. Wonderful tutorial. Also thank you for the lovely comment on my card. Ha Ha yes Faith I can clearly identify with what you say...same thing would happen to me till I was forced to find out what I was doing wrong and make an effort to improve!!! Oh it was so so nice to see you on my blog today!!! It is so great to be back...The start of your post brought many chuckles and smiles to my face, I remember what it was like to start out stamping, maybe not as hard as you had it LOL... On the flip side you did amazing with your beautiful intricate heart box!!!!!! They are gorgeous stamps and look at what you would be missing out on if you hadn't had the gentle push. I can't believe your blog has over 2 1/2 million views, holy cow!!!! I started blogging again on Friday and added a video update of Michael walking, no more wheelchair!!!!! He will have to have back surgery due to a tethered cord but not sure when. Checking out your card from Make it Monday! This is gorgeous! I mean gorgeous! Incredible! Breathtaking! Karen....it is comments such as yours which make all the tutorial making and blogging seem so worthwhile!!! YAY!! I finally reached the bottom to comment...lol...you are a popular lady and I'm not surprised and now with my DT hat on..
Ha Ha you are making me smile Chrissy with that "YAY" !!!! Leanne be sure to contact me when you reach Bangalore...will be great to meet you! I think you rocked this Sonia. Thank you so much for your generosity - your precious time and kindness you show the craft world. Bless you. Jaya for the stamping queen!!! Yippee I am doing the happy dance! this post is like "Stamping for Dummies" ;) I'm one of the dummies so THANK you so much for such a wonderful post! So Nice. You are very talented and creative. I love your blog. Your creations are also so very artistic and beautiful and neat. Your step by step clear instructions and so much information you share with us is really helpful. I have been wanting to try this for long. Now that I have read your article, I will try it. THANKS A LOT for very informative post. one thing -please share the secret-How do you find so much time to do all these and then post about them? I know being a doctor and mother you are a very busy person. Ha Ha Sailaja...just the fact that I am replying to you after so much time points to the fact that yes I dont actually find time most of the time!! WOW! This is a mind-blowing post, Sonia. I have no doubt there are so many grateful people out there... I'm one of them. You share your knowledge and experience so generously... and tirelessly. Thank you so very much! Beautiful project and very detailed tutorial. Thanks I learned some new stuff yeah!!! Have a great day, my friend-- I worked the bugs out of the computer and I can comment now, over here. Great stamping tips. Love the box and fan. I really admire the detail you put into each post, this is absolutely beautiful, all the little details are just gorgeous. Sonia, your heart box and contents are absolutely stunning! The little details are fabulous! Gorgeous, gorgeous project! I always look forward to your comments Dianne...you make them so lively I literally feel you have come to visit me in real life!! Your heart shaped box is beautiful. A real professional . Thank you for the long detailed ionformation and expecially the tables on what inks to use, when and where. This is just what the new crafter needs to know and even those that have been crating for a while and not getting the results without realising why. A brilliant post. Thank you again for the time it must have taken from your busy schedule to compile. Hugs Mrs A . Your stamps are beautiful! Excellent tutorial. cute heart shape box .. :)Its a great informative post Dr Sonia.. Thanks for the info on variety of stamps and ink pads ..and its easier for the beginners for piking up right stamps, inks and tools for stamping .. I am a long time stamper and you gave some wonderful advice. The information is much needed with a new stamper. Very interesting and will be very helpful for many. so nice of you to share. I hope to see lots of stamping projects from you. You are such a talented lady..
Ha Ha Yes Priya finallllly!! And so far I was spluring only on dies now yet another avenue has opened up to craft shop!! Very informative post.I tried stamping after reading this only. I have one doubt,can we use poster colors for clear stapms? And I tried border/lace stamp,but its not looking continouse.How should I improve stamping for lace/border?